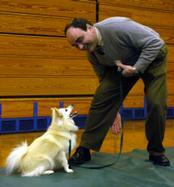 Dimitri Condes practices commanding his American Eskimo dog “Mandi” to walk through his legs during Davidow’s dog training class which took place at Keefe Tech. How do you know the hyper, playful-looking pooch bounding toward you in the park will understand those commands? You don’t. Dog owners came out in droves to a town forum earlier this month to argue in favor of allowing them to let their pets run free in the park. With little supervision from rangers, the park over the years had become a favorite spot for people to let their dogs loose. Now, after a handful of reports of misbehaving pups, and owners who don’t clean up their messes, the state wants to crack down on their on-leash rule, or at least enforce it in some areas. Arden said dogs who are properly trained can be easily controlled, on- or off-leash. But the problem, she said, is that some owners let untrained dogs off-leash too. Here’s her proposal: “For people who really want to run their dogs at state parks, they should be able to do it if the dogs are well-trained and perhaps passed the Canine Good Citizen test.” Arden also suggested communities give people discounts on dog licenses if they have a certificate for passing the American Kennel Club test. To earn the CGC certificate dog owners must pass 10 tests, according to the American Kennel Club Web site. They must prove a dog is accepting of friendly strangers, sits politely, accepts a grooming inspection, walks on a loose lead, walks politely through a crowd, sits on command and stays in place, comes on command, reacts politely to other dogs, reacts calmly to distractions and can behave the same in the hands of a stranger. Dogs can easily learn skills like these, said Bryna Davidow, a trainer and owner of Framingham-based Must Love Dogs. Davidow uses a positive signal training method that rewards dogs for performing desired behaviors. “I would rather have a dog as a friend and not be afraid of me,” she said. Arden recommends using a similar method where dogs are trained to respond to a clicker. She offers them tiny pieces of food whenever the dog sits or heels and clicks the clicker. Later, she adds the verbal command so the dog associates the click with the treat and the command and the action. She said owners can train their dogs in 2- or 3-minute sessions, and reminds them to do it in different rooms of the house so the dogs don’t begin to associate behaviors with locations. “All dogs learn differently,” she said. “When I’m training a dog I try and find the method that works best with that dog.” Davidow teachers obedience classes at dog daycare facilities across MetroWest. She said facilities like these are popping up everywhere. Davidow said she likes the idea of people running with their off-leash dogs, but not all dogs should do this.